Out in a hallway in Baskin Engineering, a group of middle-school girls were trying to deal with an intriguing problem: how to make a robot balance and roll across the room. The robot looked like a miniaturized version of a Segway scooter—but it just wasn't self-balancing like it was supposed to. The robot went "plop" and came to rest on the floor. Tackling such problems with sheer ingenuity, creativity, and teamwork is part of the fun at the weeklong Girls In Engineering program at UC Santa Cruz, which introduces girls from as far away as King City in the greater Salinas Valley to computer science and engineering through a series of hands-on activities. The girls, all of them 8th and 9th graders, use the programming environment Scratch to make games and animations, and Lego NXT kits to build microprocessor-equipped robots that can perform a wide variety of tasks, from smacking a ping pong ball across the floor to negotiating a tricky obstacle course using sensors. Their week also includes a visit to a local tech company (of which they’ve visited Cruzio and Plantronics this year), and tours of various Baskin School of Engineering labs, from bioengineering to digital games. UC Santa Cruz Professor of Computer Science Charlie McDowell and adjunct Professor of Computer Science Linda Werner were on hand to advise the students. McDowell said the camp is designed to open students' eyes to the possibility of tech as a career choice. An important aspect of this program is that most of the instruction and role modeling is done by “near peers,” UCSC female undergraduates. "This is the age where children make decisions about what is cool and what is not," said Werner, who has done intensive research about computational thinking and middle school-age children. "We lose them unless we can provide them with more opportunities in which to build their confidence, see what is in the future, and have role models." That's why several undergraduates are always on hand to help them; the idea is that students will look up to them, and perhaps see something of their future selves in those young women. Students also get an immersive sense of what it's like to be on a college campus—and the place made a big impression. Some girls in the course said they are already hoping to apply to UC Santa Cruz. Much of the funding for the Girls in Engineering program comes from the Peggy & Jack Baskin Foundation. Nicole Baran, the foundation's executive director, explained why: "We launched the Girls in Engineering program at UCSC because we believe it can address the gender gap by bringing more girls into the engineering pipeline at a young age." Everywhere in the classroom, pairs and larger teams of students were huddled together, working on their robots. 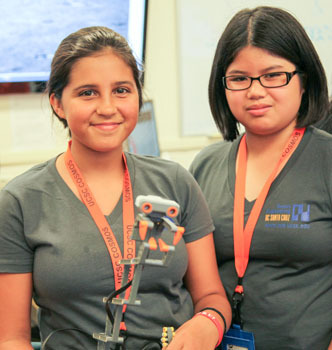 Brigette Cruz, 13, of Salinas, and Alexia Leon, 13, of Castroville, made a robot that senses motion and tries to smack anything that approaches. Cruz and Leon programmed the robot so a scolding message saying "NOT IN MY HOUSE!" appears on a built-in screen if someone rolls a ball at it. There was a good deal of hilarity and wonder in the camp that day. Electronic squawks filled the air. A robot dog awaited its master's command. Spare parts were lying in boxes, waiting to be picked up and snapped into place. But the camp also has a serious intent. In a lot of college computer science and engineering classrooms, "you look around and there are a lot more men than women,'' said student instructor Nicole Patterson (Porter '17, Earth sciences). "There are lots of male role models, a lot of male speakers who talk about careers in tech," said another student instructor, Rashmi Sehgal (Porter '17, computer science). She mentioned the need for more female role models in STEM careers, and the importance of demonstrating the idea that women are very knowledgeable in tech, and enjoy this field of study. Sehgal said UC Santa Cruz has programs that encourage women who are interested in fields such as engineering. The campus, for instance, is home to Project AWESOmE, (Advancing Women's Education in the School of Engineering),_ which was set up to identify, encourage, and nurture young women who may be interested in engineering careers. The goal of closing the gender gap in STEM fields drives projects such as this summer camp. But in the classroom, the spirit was lighthearted. Students were invited to explore their hunches and test out their ideas. And once they were done with one impressive project, they lost no time in moving on to the next one. Cruz and Leon, after designing their ping pong-ball smacking robot, got to work on their next big goal: a robot rattlesnake with intimidating jaws and a gaping mouth. "It will have ultrasound so if you get too close, it'll snap at you," Leon said.